I adore this photo I found on Flickr today. Yesterday, I said that RVing gave us a freedom to travel that we didn’t have before, but I was fibbing a bit. We had that freedom of inexpensive travel when we tent camped like the people in this photo. The freedom that the camper gave us was the ability to travel almost all year long. With the tent trailer, we can travel even with temperatures as low as 28 degrees. We could have never done that in a tent because I froze every night the temperatures dipped below 45 degrees and that was in our nice Springbar tent. 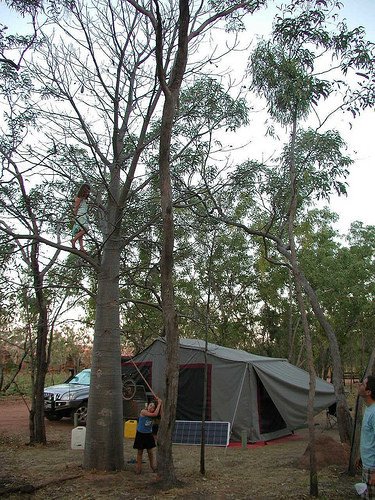 I love this picture because the tent has a solar panel and the kids are just climbing the trees like monkeys. I don’t want to go back to tent camping, but I do love seeing a well-pitched tent. I’m not a full-time RVer like she is, so when we pull out the trailer, it’s strictly for travel and adventure, not about a lifestyle. That said, I find an incredible amount of joy in that tiny tent trailer and I thought I share it with you. One of the most unpleasant parts of traveling for me was getting used to the hotel room. A hotel room never feels like home. It never feels comfortable to me. I’m not bothered by people in the rooms nearby, but the bed feels different and the pillow doesn’t smell like me. Okay, that sounded totally gross, but never discount the animal instincts of smell. With the trailer, it feels like home to me. The cleanly washed sheets are my own. The surroundings are very comforting, despite the old 90s decor. Once that trailer is popped up, any campground feels like home. With the trailer, we can cook almost anything that we could cook at home. We don’t have a fancy microwave or fridge in the trailer, but a cooler and a hot plate works for almost every one of our favorite recipes. More importantly, before the trailer, I always felt as if I were at the mercy of whatever restaurants were around. Honestly, it was a huge source of stress for me. Knowing that I can whip up a meal at the campground makes vacationing more relaxing for me because I don’t worry about what I’m going to eat. 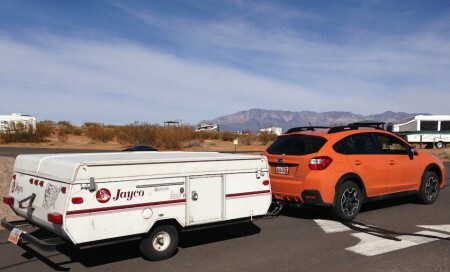 With the Prius and the Subaru XV, we get about 30 mpg while towing the trailer, so bringing the trailer hardly affects our gasoline costs. However, being able to set up the camper at a KOA or state park usually costs about 25 bucks or so, whereas a hotel usually costs about $70 (or more). We can plan more trips with the trailer than we could when we had to depend on hotels. Additionally, being able to cook at the campground saves us a bunch of money. It’s not just the worry of eating at restaurants that bothers me, it’s the cost. We save money with every meal made on that hot plate in the camper. I would rather travel more often than travel in luxury. I can do that with all the money we save by using the camper. There are some places where there just ISN’T a hotel: down by the river in the woods, up in the mountains by the reservoir, and right next to Disney World at Camp Wilderness. I have seen fireflies flashing in front of my face while I ate burgers that Mike grilled for me. I have enjoyed watching water-skiers and heard them screaming, “Woo!” during my morning breakfast and coffee. I have shivered next to a fire that’s crackling and smelling like a good Scotch, eager for its warmth. I couldn’t have had those experiences at Holiday Inn. Not even a room with a balcony overlooking the ocean could compete with some of those experiences, especially when I know that I could be camping at the campground that is RIGHT on the beach. My friend Matt Strebe once said to us, “One day of camping feels like three days.” I think that might have been because there weren’t any showers at that campground, so we all SMELLED like it had been three days. He’s right, though. When we are camping, time seems to slow down. We don’t have a TV in the trailer, so that might be why we feel like there is more time. I always feel like I don’t get enough travel time, but camping extends things a bit, making it feel longer. 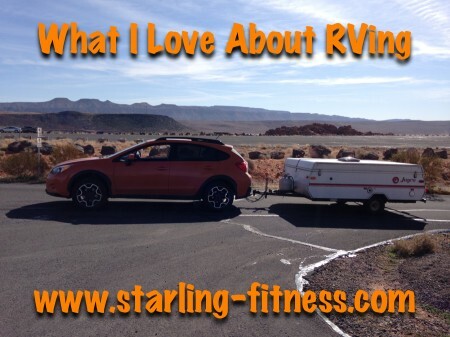 In the end, I love to hitch up the tent trailer and start driving. I look forward to it, even when it’s just a two-day jaunt for the weekend. I’m so glad that we bought that cheap trailer, even though something breaks every time we take it out, because it gives us a freedom that we didn’t have before. That’s why I love RVing. 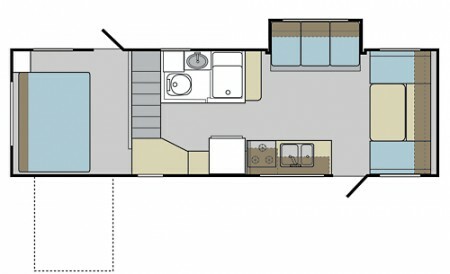 I like the floor plan. The pictures remind me of The Del Rey Kamp King Sky Lounge Truck Camper. It doesn’t look like Keystone is making these campers anymore, so that’s a shame. 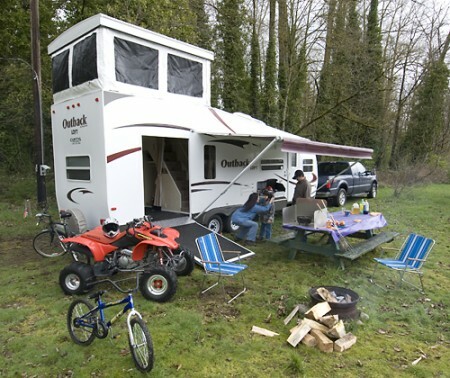 It looks like a great toy hauler with a loft and a view! 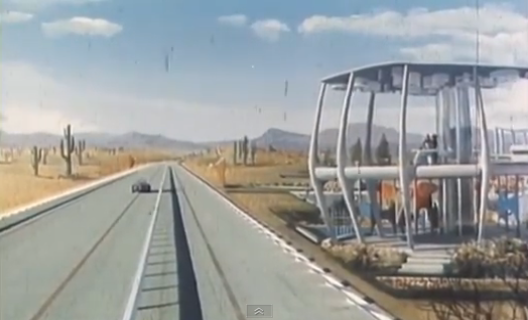 The Highways of 1976: How I Wish! This old General Motors video about how a road trip would be in the future of 1976 is painful to watch at first, but there are some interesting things about it that I wish were true. If you can get past the singing and spoken poetry, then you’ll get to see the interesting ideas for the future of road trips. The car that drives itself is the first dream for the future that never came to be. Here’s a picture of the “Electronic Control Strip” that supposedly drives the cars. Google has been working on a car that drives itself for a long time now and we still haven’t seen it. 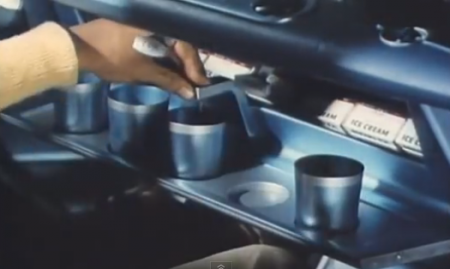 The idea of having a car that dispenses ice cream and sodas seems a bit over-the-top. Not even the high-end RVs have that. It would be cool, though. 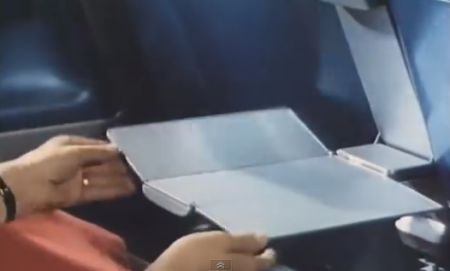 I really like this fold-down tray, though. Why don’t we have these in the back of cars. I love the design of these roads. It looks like it was set in a futuristic Zion’s Park. When the family got tired, the “Tower Man” recommended a hotel for them. At least we have a similar thing to this with all the information on the Internet. 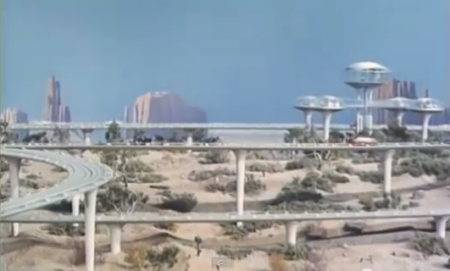 On a whole, this vision of 1976 was WAY better than the real 1976, but pales in comparison to now. 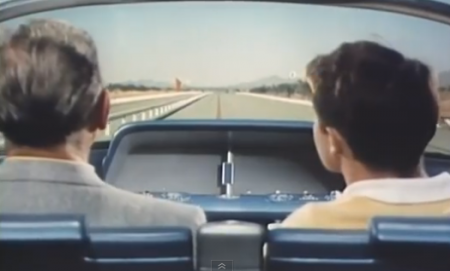 I’m pretty happy with how the future turned out and no 1956 concept of the future can compare to it. Over the President’s Day weekend, we saw this double-towing accident waiting to happen. This is called Double Towing, Tandem Towing, Triple Tow or Piggybacking and it’s DANGEROUS. It’s not legal in many states and many other states allow it only if you have a special driver’s license. This particular vehicle was towing in Utah, where it is legal with only a Class D license, but that doesn’t make it any less dangerous. It would be a heck of a lot cheaper AND wiser to teach your wife how to tow a trailer, and have her follow you in the minivan or whatever. Sorry, but I think the only people who should be allowed to tow 2 trailers are people with a CDL license. If you have a boat (or ATVs) that need towing in addition to your camper, be smart and stay away from piggybacking. No vacation or trip is worth the risk to your family. Right after Christmas in 2010, we took a trip to Disneyland with my sister and her husband. There were so many people that they LITERALLY stopped letting anyone in. I snapped this photo in front of New Orleans Square, just trying to get past the Haunted Mansion. Click to see it full-sized. We had reservations at the Blue Bayou for an early dinner, but Dan had to work earlier in the day, so he didn’t try to come in until about 3pm, but they wouldn’t let him in. It took us multiple calls to the restaurant just to get him into the park so we could have our dinner. At the same time, we couldn’t get on any rides. Mike and I rode the Pooh Bear ride (twice) and that was all we did that day. 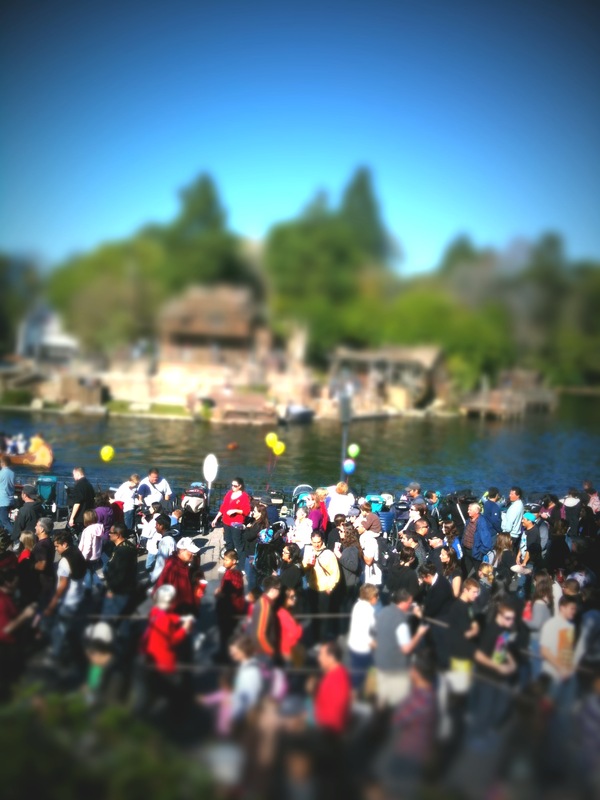 EVERYTHING was so packed that we could barely walk through the park without a crush of the crowd all around us. Whatever that number is that makes them stop letting people into the park, it’s WAY too high. I have been to Disneyland since, but I will never again go right after Christmas. It was a miserable experience and a WASTE of money. 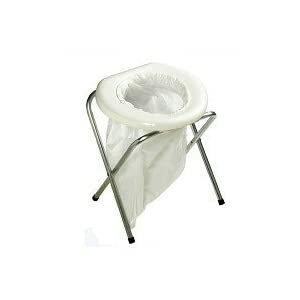 This video has been very helpful to show me how a portable toilet is used and emptied. It was such a stroke of pure logic that it shocked me. Why didn’t I think about that? We have yet to boondock anywhere that didn’t have at least vault toilets, so I don’t know why I obsess about this issue so much. 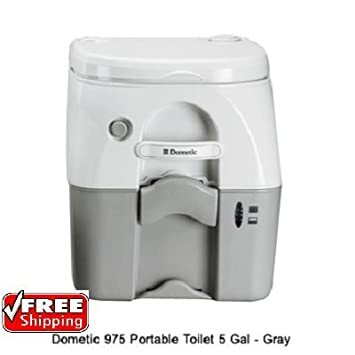 Those Dometic toilets look great, compact and easy to use, but not nearly as easy as taking the walk to the campground bathrooms.